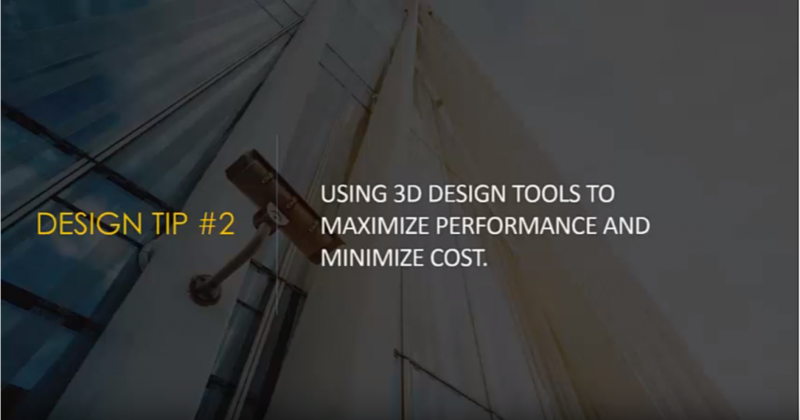 Design Tip #2: 3D Design Tools | TRUSYS, Inc.
We hope these design tips will enhance your projects and deliver more value to your clients. 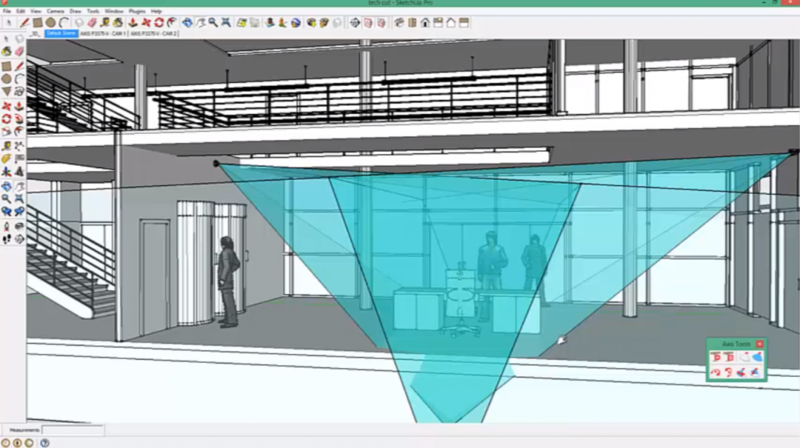 As promised, we will do a deeper dive into using 3D design tools for physical security in Revit and SketchUp. In our first example of a reception area, I am using the AXIS plug-in for Revit 2019. For this area, the operational requirement is “I”, or identification. An operator should be able to identify an unknown subject. As mentioned in our last post and video, a pixel density of 76 pixels/foot or 250 pixels/meter is required. We want to see if we can achieve the desired results with a 2MP dome camera. The camera 1 Field of View is shown in blue. The dark blue arc shows the limit of 250 pixels. Looking at the Field of View for both camera 1 and 2, we can see that the reception desk is within the pixel density area required for identification. Using Revit, we can also view the limitation arc in 3D (below). 3D view in Revit showing camera’s field of view. Using this plug-in allows us to see simulated camera views from various angles, even with wall-mount and surface mount cameras. We can look for clashes or issues, and model placement of devices to see objects that may be blocking the field of view of a camera. 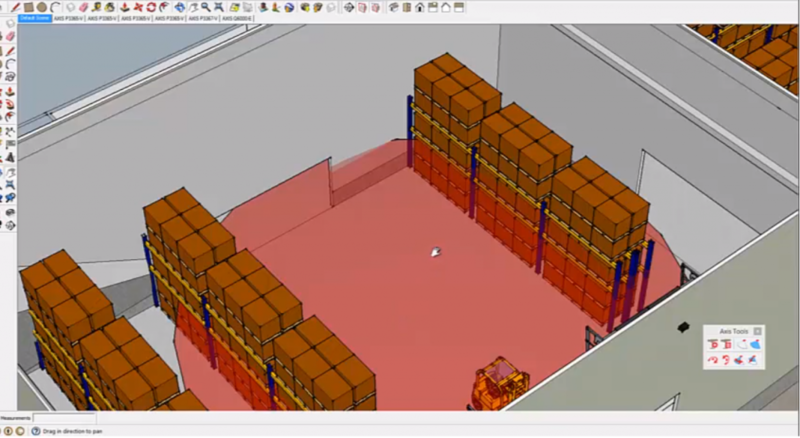 The 3D tool makes it easy to determine the optimal selection and placement for devices. We can examine conditions, view them, and make adjustments in the 3D model. If requirements change, those changes can be made here without impacting cost or performance. SketchUp model showing field of view for both cameras. We can also create models and do the same analysis with SketchUp, either by exporting a 3D CAD of the entire model or importing a section. 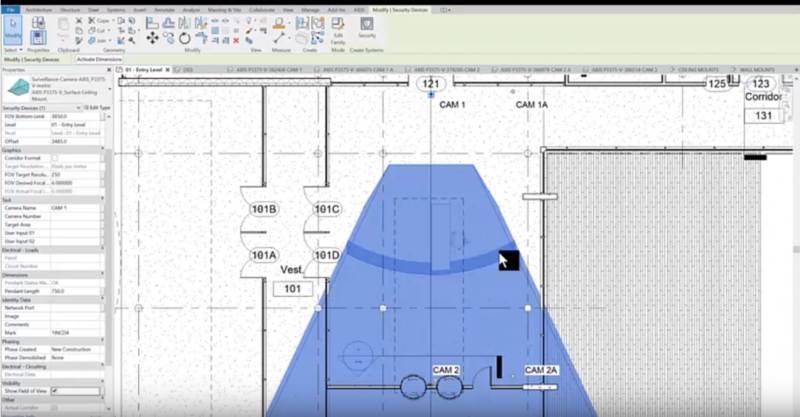 Using the AXIS extension plug-ins for SketchUp, we select the device we want from the toolbar, place them in the model, then adjust the properties for the device. By selecting the placed devices, we can turn on the field of view for the cameras. The darker teal area represents the area where we achieve 76 pixels per foot. This plug-in also allows us to see simulated camera views. Using the AXIS pan tools, we can pan through the scene looking for problem areas or things we may want to change. We can also create our own graphic representations of devices. Any sensor device can be represented with its field of detection shown. For example, a 360-degree motion detector can be shown along with its field of detection (below). The AXIS plug-in for Revit, as well as the AXIS extension in SketchUp, are two effective 3D tools for designing and evaluating achievement of operational requirements. They allow us to plan, look for issues and clashes, adjust, and preview the aesthetics as many times as necessary to perfect the design. In the next Design Tip, we will review the security design process, from assessments and planning, to construction and commissioning.